Space per pupil: 48 sq.ft. Founded in 1831, the Tuscaloosa campus of The University of Alabama (UA) is the flagship school of the University of Alabama System. 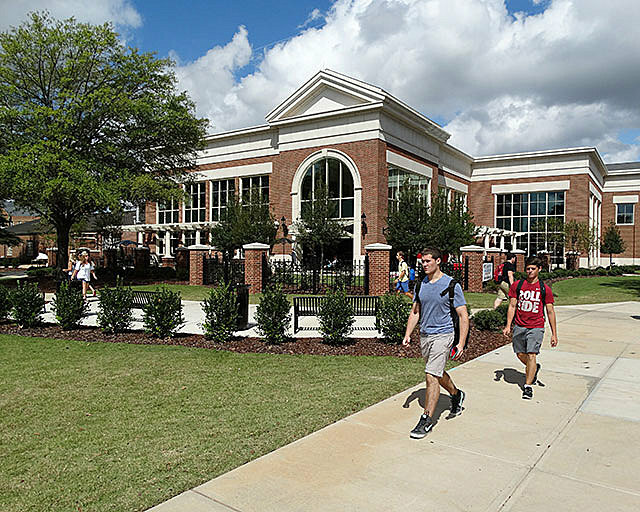 With an enrollment over 36,000 students, the University of Alabama has experienced continued growth for the last decade. To address the dining needs of this expanding student population, the campus master plan called for relocating the popular Fresh Food Company from the Ferguson Center Student Union to a new standalone building replacing the original 14,000 square-foot dining facility. Tim Leopard, assistant vice president for Construction and Dan Wolfe, University planner and designer, led site selection. After considering several locations on the congested campus, a site was chosen at the corner of Hackberry Lane and Margaret Drive. The location was selected to draw students from the residential dining facilities on the north and south ends of campus and closely relate to the Student Union and the center of campus. This site for the Fresh Food Dining Building adjacent to the Shelby Engineering Quadrangle and the planned growth areas of east campus gives the facility the potential of serving dining needs well into the future. Focus on quality of food service over quantity of space. Accommodate special programs such as music, entertainment, x-box tournaments, and movies. The building exterior incorporates brick and precast concrete in a classic Georgian style to be in character with the adjoining buildings. Examples include the tower at the southeast corner of the building that relates to the southwest corner of the adjoining Rodgers Library. Together the two buildings frame views from Hackberry Lane into the Shelby Quadrangle. Selected building elements relate to the nearby buildings in the Shelby Quadrangle, these included the precast building cornice, cast stone base and trim pieces, exterior sconces, and gabled roof elements. These features of the surrounding buildings were combined and reinterpreted so the building completed the setting, tying together two dissimilar design styles seamlessly. 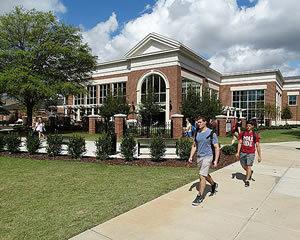 Site work included the completion of the pedestrian connection from the Shelby Quadrangle to the corner of Hackberry Lane and Margaret Boulevard; as well as a new pedestrian connection to the Student Union building to the west. A new plaza was formed at the intersection of these paths. The hardscape was accented with raised planters and limestone capped brick walls screening the dining halls loading dock. The building services, loading dock, and parking were placed to the west in a new back of house area that it shares with the adjoining Hardaway Hall and Engineering Building. Having a clear front and back to the building lowered construction cost while improving building functionality. To ensure pedestrian safety on campus, vehicular circulation was confined to a new one-way alley on the west side of the building. This improves safely by having controlled and monitored deliveries and confines vehicular parking to the rear of the building away from pedestrian pathways. 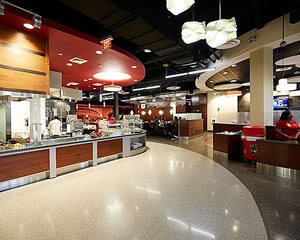 The 25,000 square-foot first floor is devoted to the dining hall and support spac­es. Current operation hours are from 7:00 a.m. to 6:00 p.m., serving up to 1,500 meals during the lunch period. Dining options include seven themed micro-restaurants arranged as an open market. Micro-restaurant themes include Italian, Chef’s Table, Deli, Salad, Home Cooking, Grill, and Dessert. Dining for up to 525 students is arranged around the perimeter in eight distinct seat­ing pockets which vary in their decor, amenities and lighting. These seating areas provide intimacy and allow greater operational flexibility. Glazed verti­cal lift doors connect the two story atrium at the southeast corner of the dining room to the adjoining outdoor dining areas for a true indoor/outdoor experience. 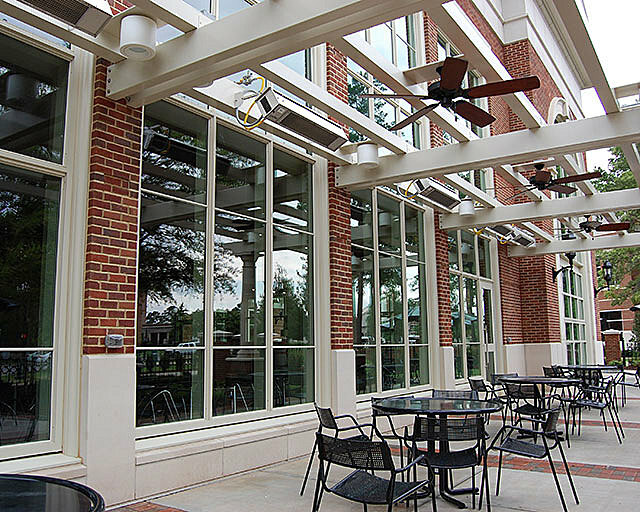 Enclosed in a wrought iron fence, the outdoor dining courtyard overlooks the major pedestrian pathways that flow around the building connecting the Shelby Engineering Quad to the center of campus. 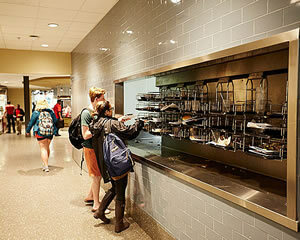 The courtyard accommodates seating for an additional 100 students providing both overflow and seasonal dining options. Awnings were included in the design to reduce the scale of the space and support outdoor fans and radiant heaters. These features along with an outdoor fireplace were included to extend the outdoor dining season well into the fall and spring. The seven micro-restaurants are supported from a central prep kitchen and a dish wash area. Adjoining the prep kitchen are staff offices. The central prep kitchen is directly connected to the central dry good storage rooms, central walk-in freezer, coolers, and the loading dock. This carefully orchestrated room arrangement mirrors the most direct process for handling deliveries and processing of food and supplies, this result in less staff time required to manage the back of house areas. The mechanical system utilizes the campus hot and chilled water system to minimize utility costs. To maximize the usable area on the ground floor for the dining hall, the majority of the mechanical equipment is located on the second floor. Support spaces on the first floor are limited to janitorial closets, restrooms, pump room, and a main electrical room. The 18,000 square-foot second floor was constructed as a shell/storage space to be finished at some point in the future for classrooms, offices, and banquet dining facilities. To accommodate these future uses a sepa­rate entry with a monumental stairs and elevator provides public access to the second floor. A service elevator provides a direct connection to the prep kitchen below for catering support to the planned banquet rooms. A central feature in the design of the building was variety. This variety begins with the seven micro-restaurants. The design team researched, programmed, and designed each micro-restaurant separately so they would relate to the planned menu with the goal of creating a venue identity without signage. These distinct micro-restaurants allows users to feel there is greater variety in dining options, which in turn creates more draw and more repeat customer use during the school year. The micro-restaurants were thoughtfully located in relationship to the main entry. Meal options such as the Chef’s Table and the Salad Bar were placed closer to the front to encourage healthy food choice while the grill was placed toward the back. This had the added benefit of lowering the pressure on the grill during peak meal service hours. Coordinated with and built around the micro-restaurants are distinct and separate dining areas. Seating areas range from secluded booths with warm soft lighting to communal tables with vibrant colors, daylighting and views. 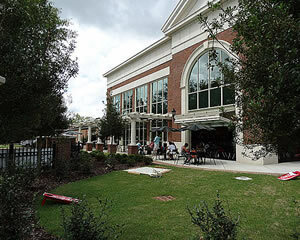 The result being students simultaneously use the dining hall for multiple purposes from group meetings and small gatherings, to communal dining and fund raising events. The main entry is located toward the north end of the building. This asymmetry provides distinct advantages to the staff, creating an inherent scalable to the use of the dining facility since breakfast and dinner services are smaller than the noon meal service, they require only a portion of the facility. The staff uses the smaller dining areas located to the left and right of the entry to service these meals. The arrangement of the building screens these areas from closed portions of the dining hall and allows the staff to create a sense of a smaller restaurant using lighting only. Over the life cycle of the facility these distinct themed micro-restaurants and varied dining areas will continue to pay dividends for the University. Because each micro-restaurant is self-sufficient with its own food service equipment and storage, they can be shut down independently with minimal impact to the remainder of the facility. This greatly increases the ability of the facility to deal with repairs or renovations. Because there is a relatively high level of modification and change in the food service sector, it is anticipated this planning will pay for itself several times over during the life of the facility. The completed project formally opened with the start of fall classes in August 2014 to great acclaim by the students, faculty and staff. 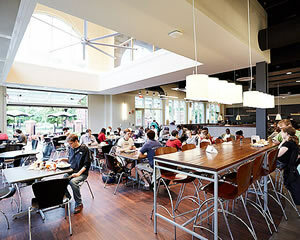 With total annual sales exceeding $5 million the dining hall is quickly paying for itself. The administration often receives requests to utilize the dining rooms for events not contemplated during the programming and has been able to easily accommodate all requests. 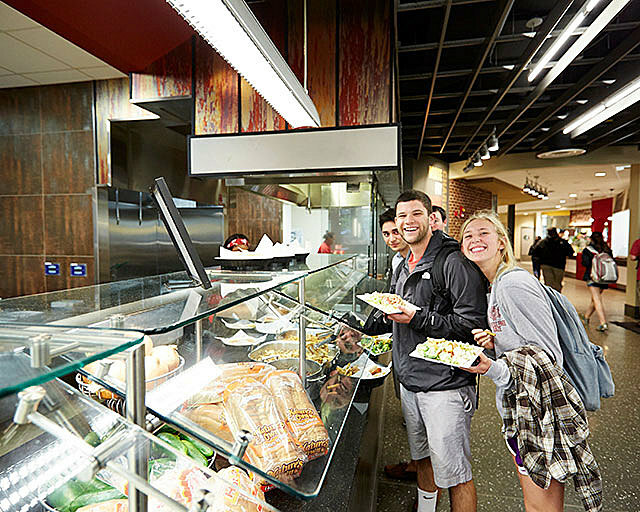 Currently operating with limited meal service during the morning and evening and only partial occupancy of the second floor; the facility has untapped potential to be an even greater benefit to the University of Alabama. General Contractor: Amason & Associates, Inc.